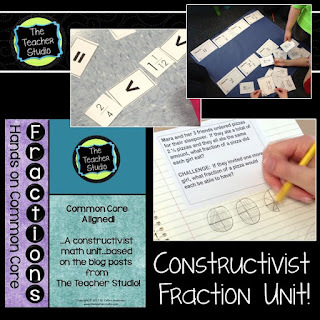 Today we kicked off our fraction unit, and I think I am going to really try to do a lot of blogging about it over the next few weeks–because I will be immersed in it AND because it is such a critical component of the Common Core for intermediate grades. 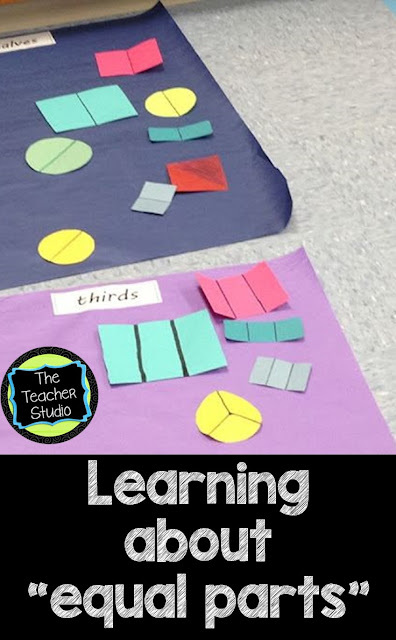 I think it is vital that we dialogue about ways to help students build their understanding of fractions, so I invite you to share along with me as I “trace” the path of our unit as it unfolds. I’ll try to be clear–but you know how I tend to get wordy! I’ll try to include lots of photos and work samples as I go, and I am hopeful that the rest of you will share great ideas and resources that have been successful for you. Today’s focus? Fraction folding! Again, knowing that the CCSS places a great deal of importance on fractional understanding, our district math team made a decision to build in two fraction units into our year–this one and another one later which will work to tie together decimals, fractions, and a more sophisticated level of understanding. And, actually, I teach a few other mini units throughout the year to keep ideas fresh. Today I started by asking students to reflect on what they already know about fractions and to rate their overall confidence (using our 4 3 2 1 ) scale (Click here to revisit earlier blog post about this!) and the results were quite amazing! In a ten minute writing time, I got to witness a number of misconceptions, poorly explained reasoning, and a bunch of “3’s” and “4’s” in confidence! Good thing I had planned on starting slowly! Today we started our new math notebooks, and I explained to the students that we are “raising the rigor” one level more (poor things have heard this all year) and we are going to work hard to use our new notebooks to both record our thinking, our practicing, and our new learning. I’ll blog more about this later as it unfolds! For today, we started the section we called “Fraction Concepts” and even talked about what the word “concept” means. Fascinating! I told the students that our job through this unit would be to determine some things we could determine to be “true” about fractions and that we would be working our way through a number of these “truths” during the unit. Today’s “truth” involved ensuring that students understand that fractions represent equal parts of something (I didn’t really want to use the term “whole” yet–I don’t really like to treat fractions of “objects” and “sets” differently until I have to!) and that we would be spending some time creating equal parts. With your partner, trace and cut out your shape. You will need many of these as the investigation unfolds. Your job is to find ways to divide your shape into equal parts. . . first in two equal parts, then three, and so on. 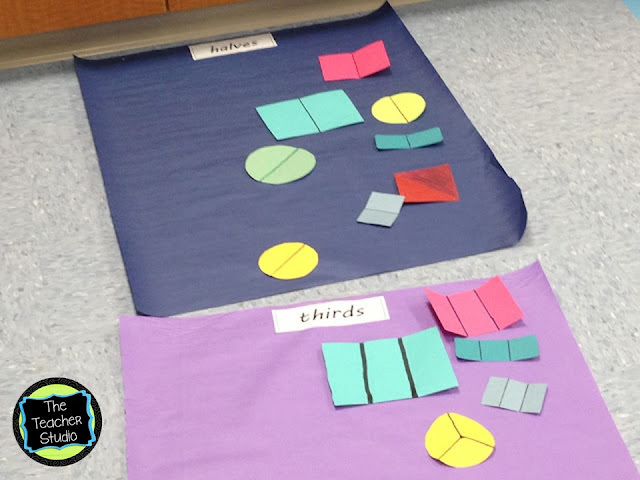 I then showed the students the following charts–each is labeled “halves”, “thirds”, “fourths”, and so on. As they discovered a way to fold their shape, they were asked to put it on the correct chart. I was on the prowl for work that was not accurate and precise. Voila! Posters are taped to the ground with deliberate “aisles” so they don’t get trampled on! Each poster is labeled with the word for the fractional part–I will use the words and different symbols interchangeably throughout the unit. NOTE: The chart does NOT say “1/3” because we were not identifying 1 out of 3 parts. Circles are the toughest as this team found! As the period unfolded (and it became clear that this was going to be a TWO DAY investigation! ), our charts began to fill up and things moved a little faster. The charts started to fill…first halves and thirds, then fourths and eighths…we’ll see how it “unfolds” tomorrow! Got to love a little math humor, right? Tomorrow we will finish up our investigation and then ask ourselves if we have discovered any new “truths” to record in our notebooks. I am pretty confident that my students would have been able to answer correctly if given a sheet of “shaded fractions” to identify. That being said, today’s activity showed me that many students are maybe missing some very critical understandings about equal parts and about patterns that arise when dividing shapes. I’m pretty sure that the work we will do over the next few days is going to be very important to build a foundation for the more advanced skills coming. Finally, if you aren’t familiar with what the CCSS requires, I would encourage you to dig in and follow along with us as we try to construct meaning over the next few weeks! 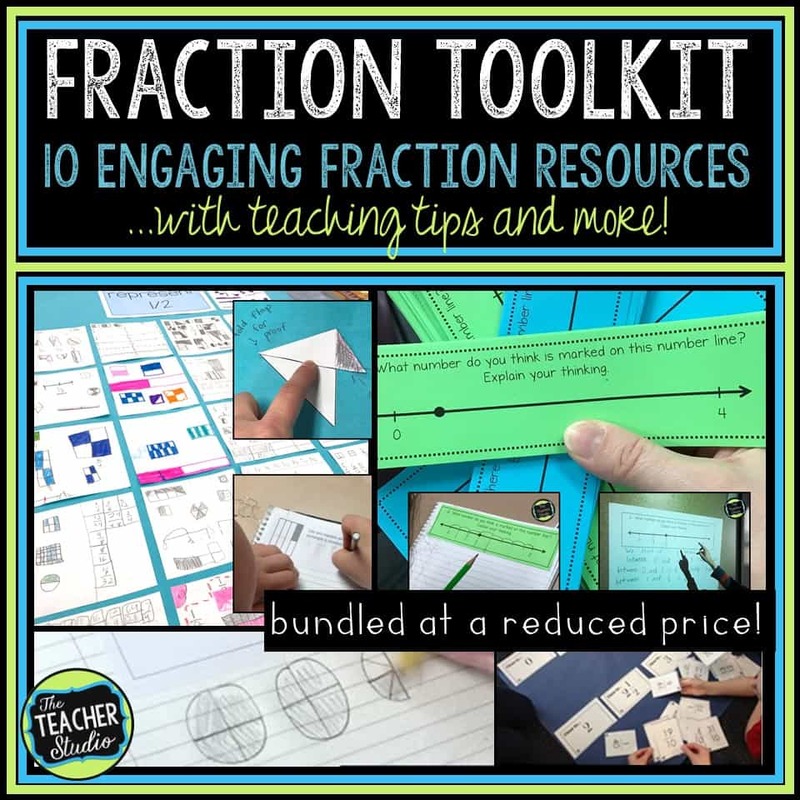 This unit is also now available as a part of a huge 10 resource bundle which offers an amazing assortment of lessons and resources to help you teach fractions at a deep level. Finally, are you interested in getting a short series of emails and freebies about teaching fractions? Just CLICK HERE to get signed up!